This is a repost from my old blog. It was originally posted in Jan 2009. I wish I could go back to Chicago with my notebook and some Crayola markers (my favorite thing to use when writing, for some reason-- I think it's smoother on my weird-way-of-writing left hand, just like our President! 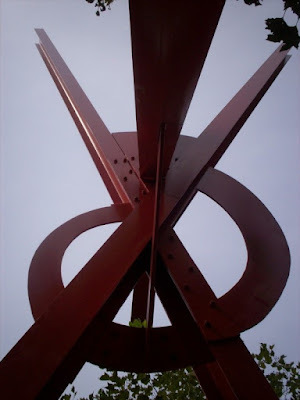 See photo at the very bottom of the entry) and sit under Mark di Suvero's sculptures and write stuff. Them Noo Yahk Skewl doods were all about the comingling of art and poetry. There was some quote I wrote in the NYT about all the poets going to the artists bar to sit there & listen to them then go home and write about it: googling, and... ah, yes, the review of Frank O'Hara's collected poems. 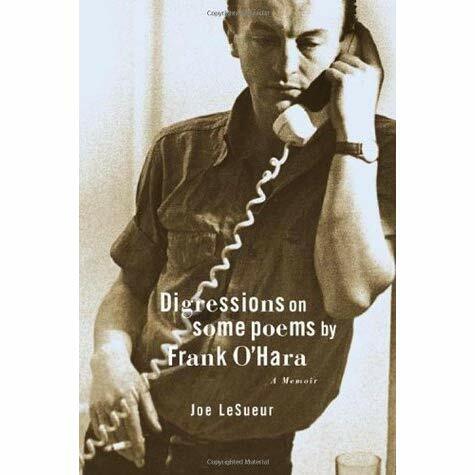 "'We often wrote poems while listening to the painters argue,' Frank O’Hara recalled." This was at the Cedar Tavern. I thought about Mark di Suvero today because there's a poetry reading in Cambridge this weekend with Mark Lamoureux, who I've heard of from a bunch of other poets I know and I was curious about him, cause I was thinking of going to the reading but then realized I can't because I'm back to working on Saturday's and it's during work hours. Total let down, as the post-Stonecoast, still underemployed life I'm leading makes me take lots of accidental naps. I don't like it. Nonetheless, I'd started looking Lamoureux up on the internets, which got me to his flickr page, which I was sifting through, cause why not, which lead me to his photos of the Storm King Art Center, which had the distinctive steel and bright orange sculptures of Mark di Suvero, so I started thinking about that artist and how I wanted to look at the sculpture in this post, the photos of which I took at Millennium Pakr, Chicago back in October. So, that's that for now. 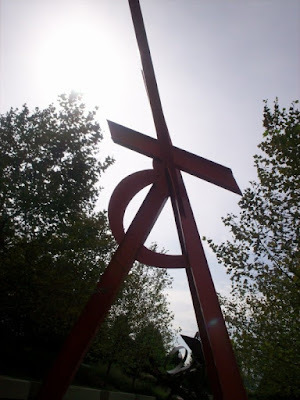 The point is I see art and I like it and it makes me write. Oh, wait, one more addition to this story! Yikes, I can't believe I forgot! Lynne Drexler's work is on exhibition at the Portland Museum of Art, where I went last Tuesday and I saw that she would go to the opera and sketch while listening to the opera. Then she'd turn those sketches (abstract, colorful, expressionist sketches) into paintings. I write the same way!